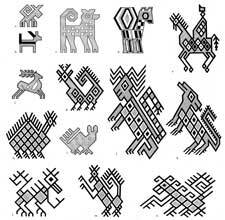 The male and female figures on textiles [top picture], called muñecas (dolls), are of unknown origin. The female figure appears more frequently than the male, generally with arms akimbo. Rows of small dolls decorate the huipils [women’s tunics] of the Cobán area whereas larger, individual figures are prevalent in the weavings of Chichicastenango and Nebaj (see our example, pic 1). The most common bird motifs are those of hens, peacocks and turkeys, but it is often impossible to differentiate between the various species as full rein is given to the imagination, and five- or six-legged creatures are not at all unusual. 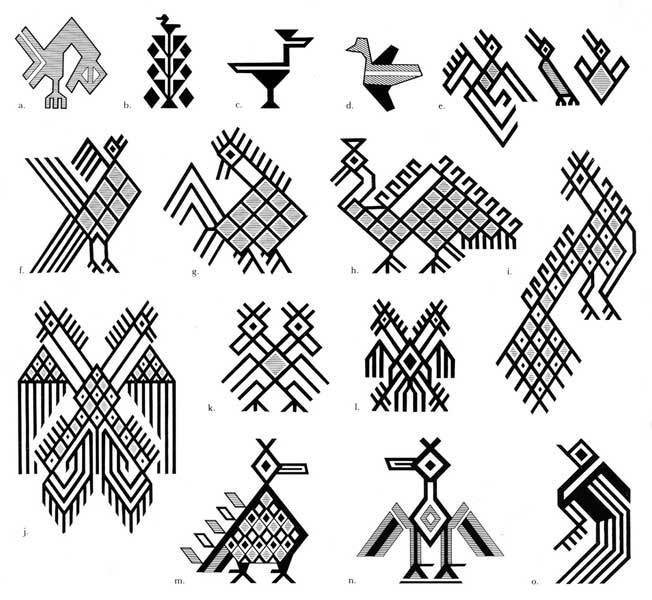 One easily recognisable design, however, which could represent a sacrificial bird, is the so-called dead-turkey motif [see pic 2a], a bird with a bent neck often found in ceremonial huipils... The bird-on-plant motif [pic 2b] ... could relate to an incident in Maya mythology in which the Sun God, while courting the Moon Goddess, turned himself into a humming bird to flutter round a tobacco plant in the courtyard where she was weaving. Double-headed birds are motifs frequently used for decorating ceremonial garments... [see pic 2j,k,l] and though they appear on Maya clay seals, could equally be drawn from the double-headed eagle of the Spaniards, granted as an emblem to a branch of the Quiché Indians in the sixteenth century. 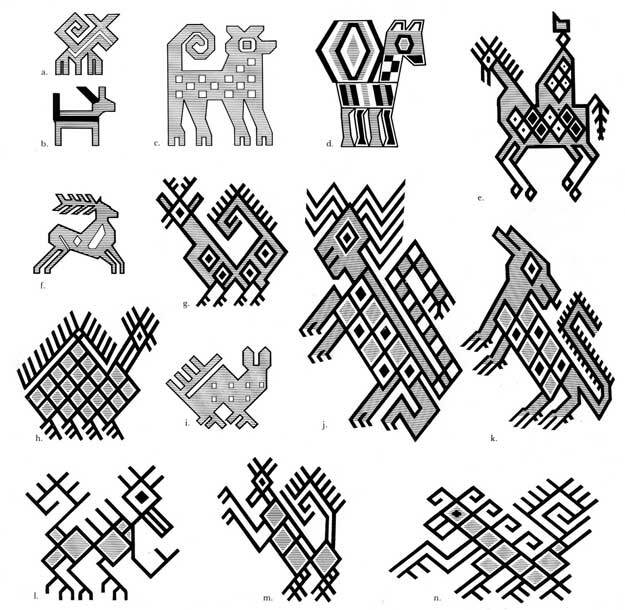 With a few exceptions animal designs pose less of an identification problem than bird motifs: dogs [pic 3a,b,c], rabbits [pic 3i], horses [pic 3d,e] and deer [pic 3f,g] are relatively easily recognisable. Deer held particular significance in Maya mythology and the Dance of the Deer, originating from pre-Conquest times, is still performed at festivals today. The coyote [pic 3k] features prominently in North American Indian mythology and is also mentioned in the Popol Vuh as one of the animals who brought corn to man. The opposum (a manifestation of the Maya God of Dawn) is a common motif in some villages [pic 3h], whilst the monkey is a widely used figure, easily recognisable by its conventionally raised forelegs and long tail [pic 3l,m,n]. Like the deer, the monkey features both in the Popol Vuh and the ritual dances performed today.